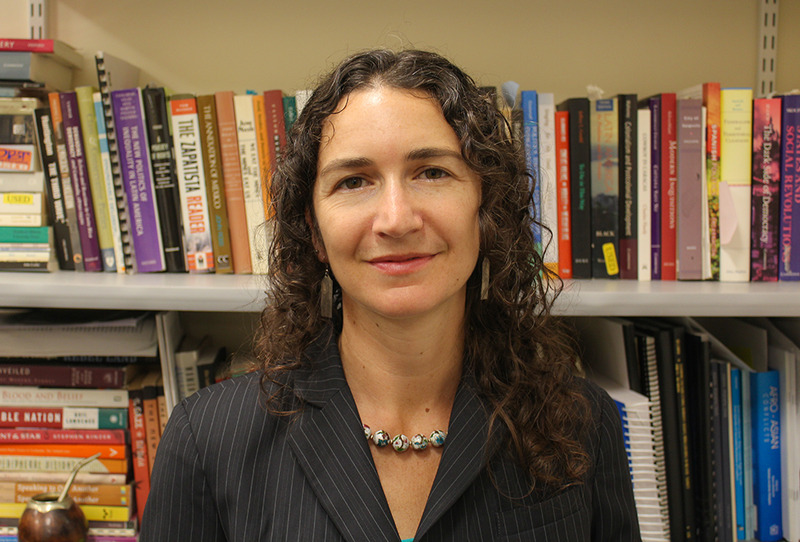 Mneesha Gellman is the director of the Emerson Prison Initiative and an assistant professor. The Emerson Prison Initiative launched at the Massachusetts Correctional Institution at Concord this semester, making an Emerson liberal arts education accessible to those behind bars. Mneesha Gellman, assistant professor and director of EPI, said she created the program’s mechanisms and the admissions process. Eighty-six eligible participants who have earned a GED or high school diploma and a disciplinary background that met the program standards applied in August. The applicants completed a timed essay exam, she said. The essays were read by Gellman, Daniel Karpowitz of the Bard Prison Initiative, and the EPI Faculty Advisory Committee—which is made up of Assistant Professor Eileen McBride, Associate Professor Paul Mihailidis, and Engagement Lab Director Eric Gordon. The committee interviewed 40 applicants and decided which 20 would be the inaugural class of Emerson inmate-students. “For the students inside, I hope that the class provides a means of intellectual engagement that allows them to seek out more … and to do their time better and in ways that are productive so that whether or not they will be released during their lifetime, they have the dignity of intellectual engagement,” Gellman said. Concord has a bad reputation among inmates because the prison doesn’t offer any education beyond the GED program, Gellman said. “We are charting new territory with MCI in inventing what the college in prison program looks like [at Concord],” she said. Gellman said the section of Interdisciplinary 154 Power and Privilege that she’s teaching at Concord is identical to her main campus course. The class is an introduction to social science freshman seminar. The lack of internet access at the prison poses Gellman with unique challenges, she said. The classroom space has a computer, but Gellman said the restrictions on what can be brought into the prison makes certain elements of the class, like screening documentaries, impossible. The college funds the basic cost to operate one course at Concord. The program is on its third week of a three-year, six-semester pilot program that will be evaluated in the third year to determine the future of EPI, Gellman said. The first class of inmate-students are receiving credit for the course, but they are not yet on the path to earning a degree. Gellman said the goals of the program are moving participants up to 300- and 400-level classes, allowing them to specialize, and awarding participants with an associate’s degree or an Emerson bachelor’s degree. Gellman said that she’s already arranged for a grant from the Bard Prison Initiative to increase the curricular offerings to two classes for spring 2018. She said she hopes that fundraisers can raise enough to support this curriculum size going forward. “It’s really great to have this brand new program that’s already expanding in that way,” Gellman said. Classes take place on Mondays in a classroom space at the medium security prison, Gellman said. “Anytime we can do a partnership like [EPI], it’s beneficial to the inmates. The more educated an inmate becomes, the more likely they are to not reach recidivate,” Assistant Deputy Commissioner of Communications at the Massachusetts Department of Correction Christopher Fallon said. Amy Ansell, dean of liberal arts, said she thinks EPI is an opportunity for the inmate-students to reflect on their past, present, and future and gain solid skills to facilitate their highest aspirations. Daniel Karpowitz, director of national programs at the Bard Prison Initiative, said he’s impressed by the college’s principled and thoughtful approach to a college-in-prison program. Gellman said the college is considering joining The Consortium for the Liberal Arts in Prison, a union of seven college-in-prison programs based out of Bard College. Gellman said she first volunteered in the Bard Prison Initiative when she was completing her undergraduate degree at the college. After graduation, she said she continued to teach in prisons because she finds the work meaningful. She said she brought the idea to Emerson a year and a half ago, spending that time speaking to deans about how to make it a reality. Gellman said the community should not view the program as charity because the inmate-students earned their seats. The EPI acceptance rate is 22 percent, she said, compared to the college’s 48 percent.